^ Paul Dupuy, « La vie d’Évariste Galois © Elsevier », 1896年6月。http://archive.numdam.org/article/ASENS_1896_3_13__197_0.pdf (再版：Jacques Gabay, Paris, 1992). ^ Isaac Asimov, Treasury of Humor, page 202. Freeman, Joanne B. “Dueling as Politics: Reinterpreting the Burr-Hamilton Duel.” The William and Mary Quarterly, 3d series, 53 (April 1996): 289-318. Greenberg, Kenneth S. “The Nose, the Lie, and the Duel in the Antebellum South.” American Historical Review 95 (February 1990): 57-73. Morgan, Cecilia. "'In Search of the Phantom Misnamed Honour': Duelling in Upper Canada." Canadian Historical Review 1995 76(4): 529-562. Rorabaugh, W. J. “The Political Duel in the Early Republic: Burr v. Hamilton.” Journal of the Early Republic 15 (Spring 1995): 1-23. Schwartz, Warren F., Keith Baxter and David Ryan. “The Duel: Can these Gentlemen be Acting Efficiently?.” The Journal of Legal Studies 13 (June 1984): 321-355. 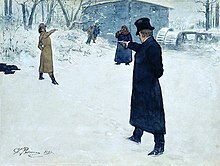 "Duels and Dueling on the Web", "...a comprehensive guide and web directory to pistol and sword dueling in history, literature and film..."